South Kerry Development Partnership CLG is a community led local development company. It was founded in 1991, and was one of the first area based partnership companies to be established by the Government under the auspices of the then programme for Economic & Social progress (PESP). The establishment of local development companies like South Kerry Development Partnership CLG, followed a realisation by government that what was needed to tackle the economic and social problems of rural areas was a localised community based response. The local community, working in partnership with statutory agencies, the social partners and local government, could take responsibility for addressing the economic and social problems within their communities. Strategies and related actions could be developed locally, with local ownership and in response to local needs this ‘bottom up’ approach to Rural Development is a core ethos of South Kerry Development Partnership CLG and it provides the organisation with a methodology of working which informs the design, development and implementation of its rural development initiatives. 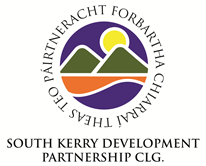 South Kerry Development Partnership CLG is an experienced rural development organisation and has successfully implemented numerous state & EU funded rural development programmes since its foundation in 1991. It combines an economic development role, creating sustainable jobs and attracting investment with community, cultural and social development activities. South Kerry Development Partnership CLG works with a very broad range of stakeholders, including individuals, communities, businesses, networks, cooperatives, government agencies and departments. It is a non-governmental organisation and is legally established as a Company limited by guarantee with registered charitable status with the Irish Revenue Commissioners. The operation of South Kerry Development Partnership CLG is overseen by a voluntary board of directors consisting of 22 members representing four key pillars, The Community & Voluntary Sector, The Social Partners, Statutory Agencies and Local Government. The community & voluntary sectors is the largest pillar on the board.